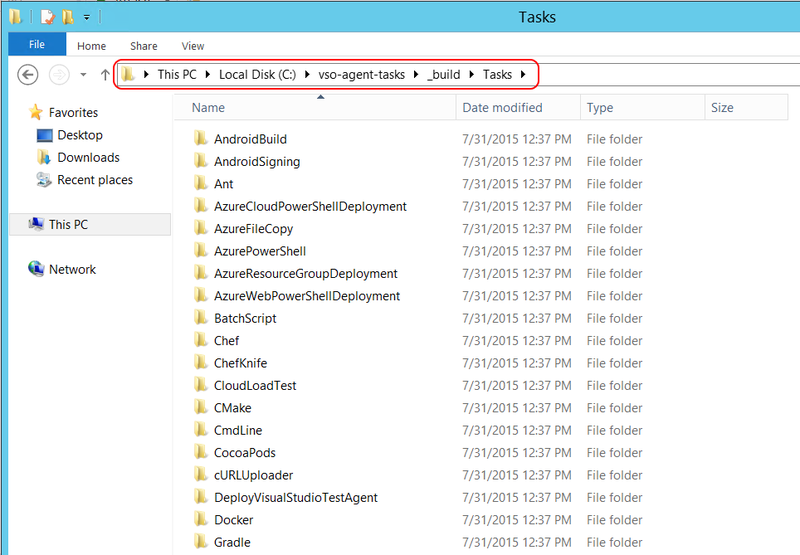 This post will show you how you can build and upload a custom task to VSO or TFS. 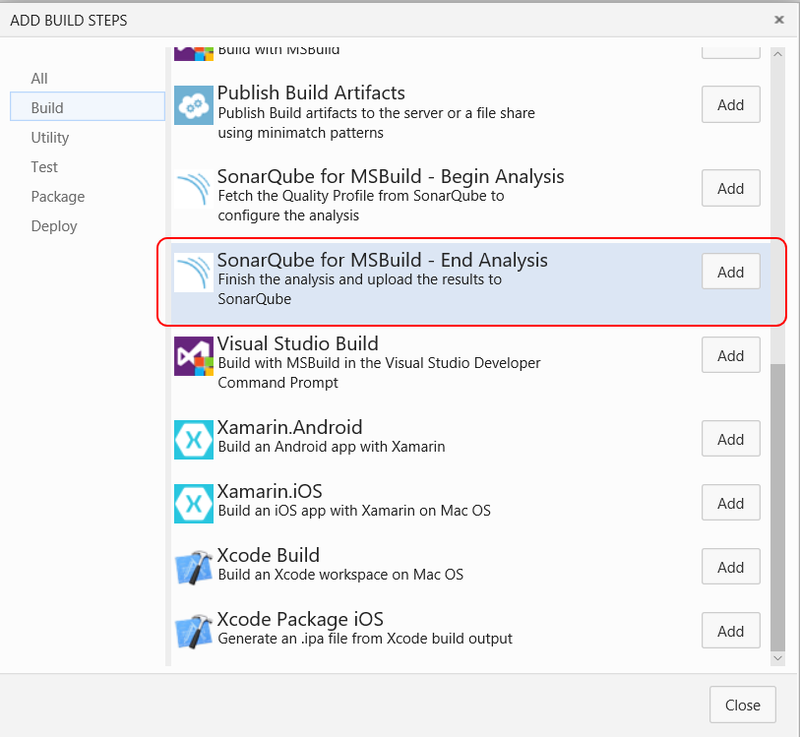 For this post we’ll use the “SonarQubePostTest” task, which is not yet publicly available on VSO. However, the code is already there in the Git repository. I have Node 0.12.7 and npm 2.11.3, so I’m good to go! 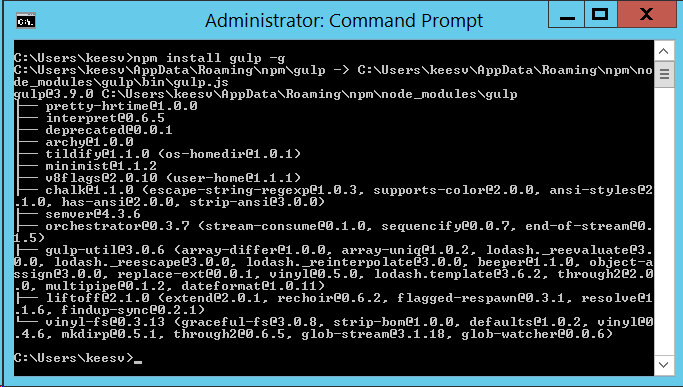 Now install gulp by typing “npm install gulp -g”. Finally, make sure you have a Git client installed. I’m using the built-in client that’s in Visual Studio 2015, but you can use any Git client you like. 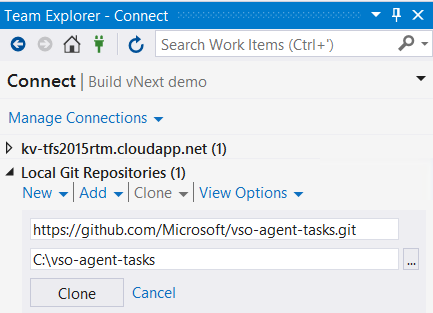 You’ll need to have a local copy of the vso-agent-tasks Git repository. You can get one by cloning the repository from GitHub. When using Visual Studio 2013 or 2015, you can do this by going to the “Connect” tab in Team Explorer. Then, click the “Clone” button and enter the URL for the Git repository and a local folder. When you click the “Clone” button, you’ll get a local copy of the repository. Before you can upload the tasks, you’ll need to build them. And of course, we’ll first need to fetch some dependencies. To do that, “cd” to the root of the repository (“C:\vso-agent-tasks”) and execute “npm install”. 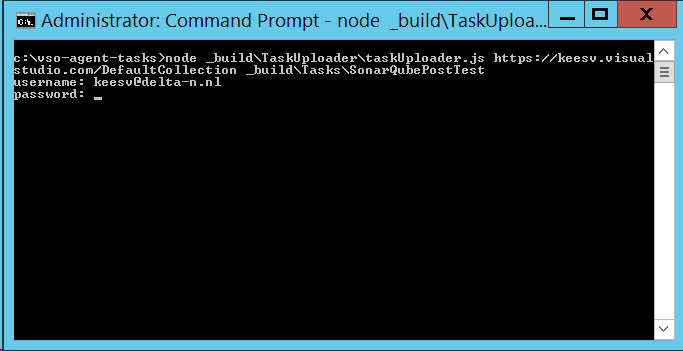 Then, again from the root of the repository, execute “gulp” to build the tasks. It’ll take a few seconds and should finish successfully. You’ll end up with a “_build” directory which contains the built tasks. This is the fun bit, which isn’t documented really well. In the vso-agent-tasks repository there is a small utility called the “TaskUploader”, which will allow you to upload a task to VSO and/or TFS. We’ll first need to build it. This can be done by executing “gulp uploader” from the root of the repository. You’ll get a built version in the “_build” subdirectory. You’ll be asked for your username and password. These need to be your alternate credentials. After a while, you’ll see a bunch of Json data as the response of the server. 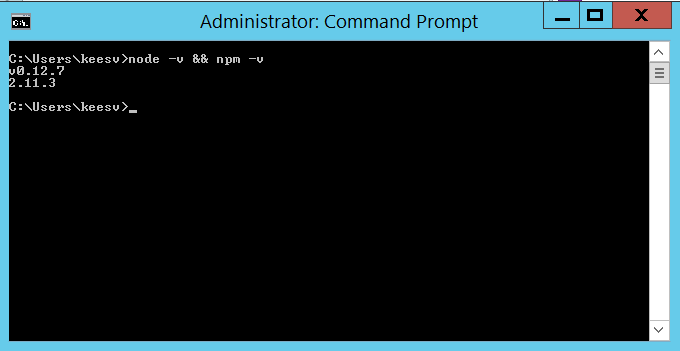 In there, you should find a statusCode and statusMessage, which should tell you that the task was created. 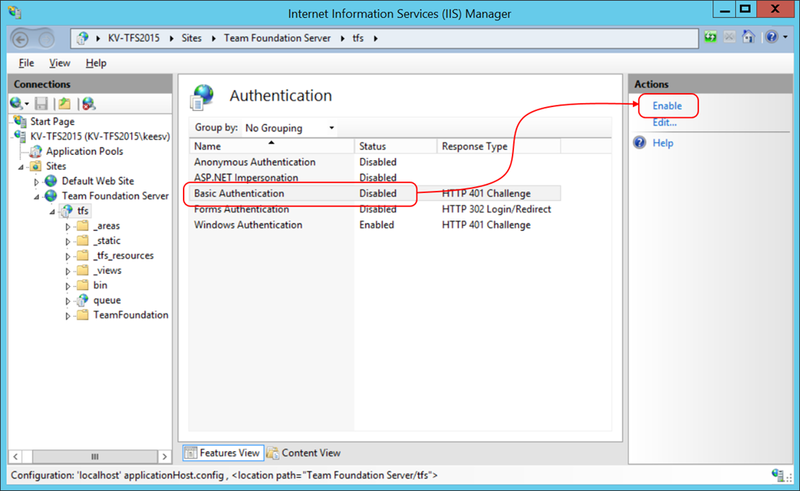 Because the taskUploader relies on “Basic Authentication”, you’ll need to enable that on IIS on your TFS application tier. By default, this is disabled. 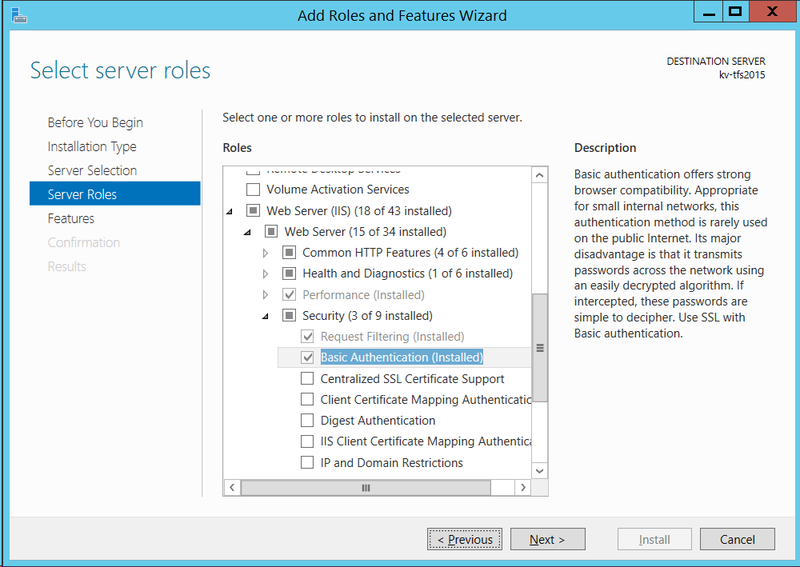 To enable “Basic Authentication”, go into “Add Roles and Features” and make sure that “Basic Authentication” is installed (under “Web Server (IIS)”, “Web Server”, “Security”). 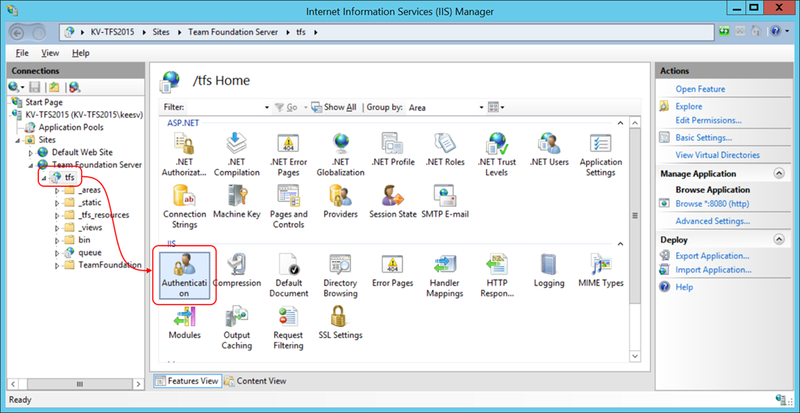 Then, go into IIS manager and navigate to the “tfs” node under “Team Foundation Server” and open the “Authentication” module. 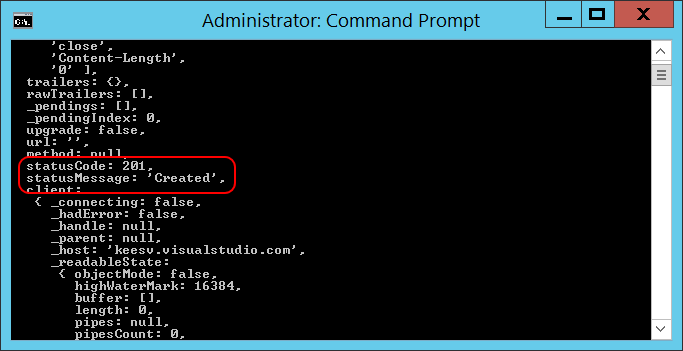 After that, you’ll be able to upload the task to your on-premise TFS server. Just make sure you’re using the URL for your collection and of course a valid user. 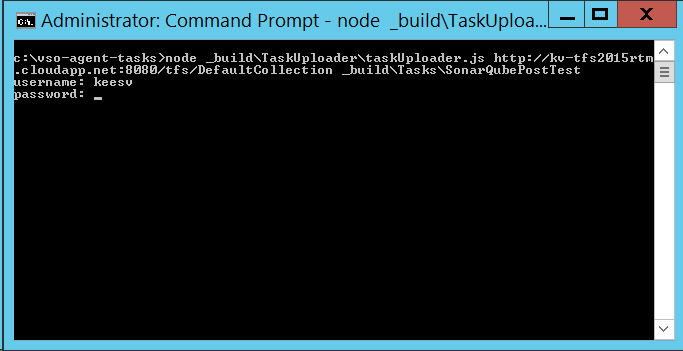 But how do I update (or remove) an uploaded task with taskUploader.js? Do you got any info on that? I just edited the taskUploader.js application to support the task removal. It gets the job done! Nice work! I didn’t get around to updating or removing tasks yet. Could you share your changes? I added a new member to the credentials interface. It gets the value from the prompt and use it as a HTTP verb when calling the api via _sendFile(). One quick doubt seeing your experience with Builds vNext. In the XAML Builds I have workspaces that mimic the TFS code structure and some dependencies from the SLN to some files (signatures, code analysis, etc) to files that are “global” and exist in a Code Line that is different from the one of the Solution. So, there is a build that downloads all of those files and lets the other builds compile with those paths. 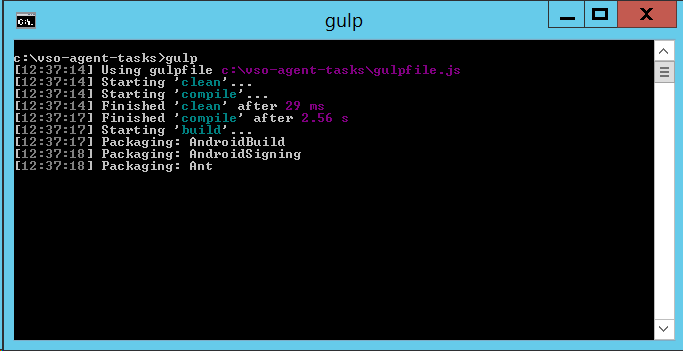 However, in Builds vNext I’m trying to NOT depend on fixed workspaces and stuff. Is it possible to use a custom task that adds those files to the “Working Folder”? 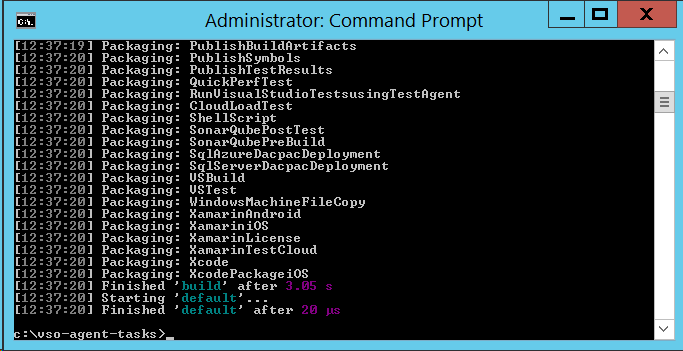 Or does the new system have something better for “Visual Studio Builds” already integrated? thanks for the compliment! For dealing with shared code you can of course still use custom workspace mappings to get everything in the place where you need it. Another option is to create a task that will simply download some files to your working folder, or create a powershell script that does that and wrap that in the “Powershell” task. However, I would encourage you to package your shared code in a NuGet package. You can create a build definition that creates a NuGet package with your shared code (from the separate Code Line) and publishes it to a NuGet feed. Any solutions that depend on that code can then consume your package from that feed. That way you have full control on your dependencies.